The Northeast Frontier Railway (abbreviated NFR and पूसीरे), is one of the 18 railway zones in India. Headquartered in Maligaon, Guwahati in the state of Assam, it is responsible for rail operations in the entire Northeast and parts of West Bengal and Bihar. Each of these divisions is headed by a Divisional Railway Manager, a Senior Administrative Grade officer of the rank of Joint Secretary to Government of India. The departmental setup at headquarters level and divisional setup in the field assists the General Manager in running the railways. Various departments namely engineering, mechanical, electrical, signal & telecom, operations, commercial, safety, accounts, security, personal and medical are headed by a Senior Administrative Grade / Higher Administrative Grade officer, provide technical and operational support to the divisions in train operations. In 1881, railway first came to Assam when Assam Railway and Trading Company set up metre gauge track. 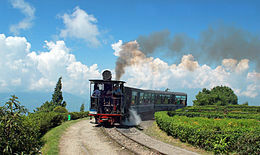 The 65-km-long metre gauge line from Dibrugarh to Margherita was constructed mainly for transportation of tea and coal. This company later started the first passenger train in Assam by the name of Dibru Sadiya Railway. The North Eastern Railway was formed on 14 April 1952 by amalgamating two railway systems: the Assam Railway and Oudh and Tirhut Railway. Later, it was bifurcated into two railway zones on 15 January 1958, the North Eastern Railway (India) and the Northeast Frontier Railway. to better serve the needs of the northeastern states. Railway service was established in Tripura in 1964, but it was limited to Dharmanagar and Kailasahar. The northeastern state capital came on India's rail map with the advent of the railways in the subcontinent in 1853 and the foundation stone of the 119 km Kumarghat–Agartala railway project was laid in 1996 by the former Prime Minister H. D. Deve Gowda. Following which railways were built in Agartala the capital city of Tripura after slightly more than a decade as passengers became more predominant in the region and railways were a mark of success in the state. Agartala expects better and faster trains in the upcoming coming decade. The area of Northeast Frontier Railway operations is characterized by exceptional beauty and at the same time by some of the most arduous terrain. This difficult terrain limits the rail network expansion, and the only state with a decent rail network is Assam. The network is not broad gauge in many parts and the rail lines are antiquated with speeds at some sections being limited to a maximum of 30 km/h (19 mph). Before the Saraighat Bridge was constructed, passengers had to get down on the Amingaon side of the Brahmaputra and take a ferry across to Pandu Junction from where they could resume their journey. The majority of the tracks have been converted to BG and electrification is in process starting from Katihar till Guwahati. The Darjeeling Himalayan Railway is maintained and governed under the responsibility of Katihar division. It ascends 6,850 feet (2,090 m) from New Jalpaiguri (Siliguri); the climb begins at Sukna, continues uninterruptedly to Ghum (7,407 ft or 2,258 m) and descends the final 5 miles (8.0 km) to Darjeeling. 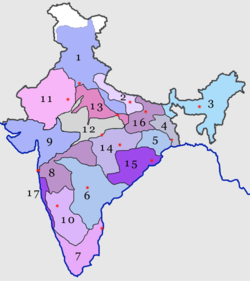 After independence, India's partition resulted in the isolation of the Northeast region. Consequently, the DHR was merged into Assam Railways, it was closed for the construction of the Assam–Bengal link line and one of its extension lines to Kishanganj was converted to metre gauge. DHR's other extension line to Kalimpong was washed away due to floods. On reopening, the DHR was merged with North Eastern Railway in 1952 and later into Northeast Frontier Railway in 1958. An interest in DHR all along has ensured that it continues to operate notwithstanding very heavy losses. The steam locomotive is an icon of this Railway. Tindharia workshop has kept 13 locomotives surviving, some of which are over 100 years old and the youngest is about 70 years old. ^ "Agartala now on India's rail map". iGovernment › Infrastructure. igovernment.in. Archived from the original on 15 June 2013. Retrieved 12 April 2013. Dutta, Arup Kumar (2002). Indian Railways, the final frontier: genesis and growth of the North-East Frontier Railway. Guwahati: Northeast Frontier Railway. LCCN 2003308231. This page was last edited on 12 March 2019, at 14:12 (UTC).